LIME is a peer-to-peer mentoring program between Lafayette students and high school students from Madagascar to prepare the latter for the process of applying to colleges in the US. Ten Lafayette students are chosen each year to participate in the program in which they work with Malagasy students from Lycee Andohalo, a public high school in Antananarivo. Lafayette students formally commit to mentoring over a 1.5 year period which includes a three week trip to Madagascar in January. The informal commitment is for a lifetime! Who are the Malagasy students in LIME? 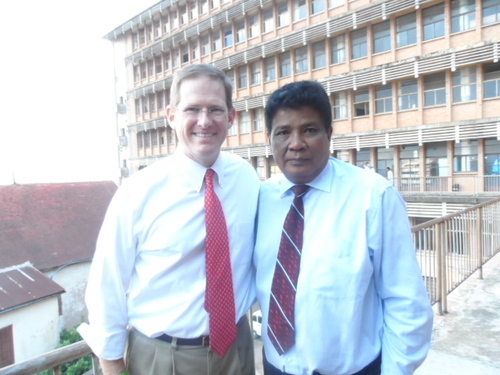 Each year, the number of Malagasy students interested in being a part of LIME is increasing! As we get more talented young people, the competition for one of the coveted spots becomes increasingly intense. Although our youngest group of students (LIME 3) had 26 students, only 10 students were invited to participate in the next level (LIME 2). From the LIME 2 cohort, a group of 7 students was chosen to participate in LIME 1 and complete the final stages of the college application process, including filling out the Common Application and taking the SAT and TOEFL. Although we are willing to give advice and help regarding college applications to any interested student, with limited funding at our disposal, only the most promising Lycée Andohalo students can receive intense one-on-one counseling and funding to take the necessary tests and submit applications to be considered for American universities.